Security software firm VirnetX accused Apple of infringing four of its patents in its use of Facetime – an application that allows for video calls on mobile devices. 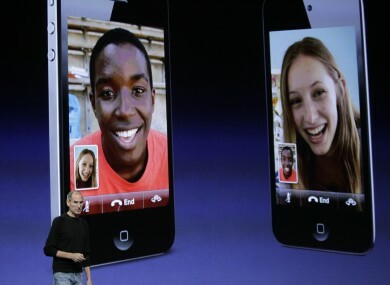 Late Apple CEO Steve Jobs presenting FaceTime on iPod Touch. Wednesday, Sept. 1, 2010. APPLE HAS BEEN ordered to pay $368 million for patent infringement in its use of Facetime, an application that allows for video calls on mobile devices, the plaintiff said Wednesday. Security software firm VirnetX said in a statement the jury in a federal court in Texas ordered the payment “for infringing four VirnetX patents” and that the court will hear post-trial motions in the upcoming weeks. VirnetX alleged in its suit that Apple should have paid a licensing fee to use the technologies allowing for secure connections using Facetime. VirnetX had sued Apple, Cisco Systems and others in 2010 for patent infringement. It alleged Apple’s iPhone and iPod Touch infringed on the patents, which allow a type of virtual private network for secure mobile video calls. Email “ Apple ordered to pay $368 million in patent case”. Feedback on “ Apple ordered to pay $368 million in patent case”.